The Crown of Frederick I (German: Krone von Friedrich I. ), was made by the Court Jewellers for Frederick I of Prussia in 1701, who crowned himself and his wife Sophie Charlotte in a baroque ceremony at Königsberg Castle, Königsberg. The crown was also used for the coronation of Frederick William I and his son, Frederick II (better known as Frederick the Great). He was a very frugal monarch, and although the crown was present at his coronation, he did not wear it. The crown along with most of the Prussian royal regalia is kept at Charlottenburg Palace. ^ Beier, Brigitte (2007). Die Chronik der Deutschen (in German). wissenmedia. p. 162. ISBN 3-577-14374-6. 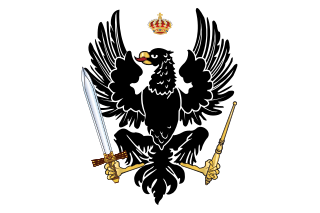 Albert of Prussia was the 37th Grand Master of the Teutonic Knights, who after converting to Lutheranism, became the first ruler of the Duchy of Prussia, the secularized state that emerged from the former Monastic State of the Teutonic Knights. Albert was the first European ruler to establish Lutheranism, and thus Protestantism, as the official state religion of his lands. He proved instrumental in the political spread of Protestantism in its early stage, ruling the Prussian lands for nearly six decades (1510–1568). Martin Sigismund Eduard von Simson was a German jurist and distinguished liberal politician of the Kingdom of Prussia and German Empire, who served as President of the Frankfurt Parliament as well as the first President of the German Parliament and of the Imperial Court. He was ennobled by Frederick III in 1888. 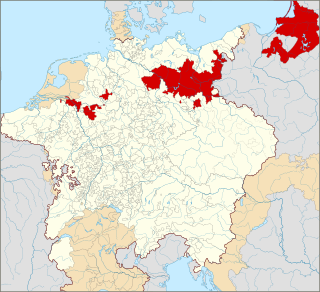 The Treaty of Königsberg was concluded on 7 January (O.S.) / 17 January (N.S.) 1656 during the Second Northern War. Frederick William I, the "Great Elector" of Brandenburg and duke of Prussia, was forced to join the Swedish camp and became a Swedish vassal for the Duchy of Prussia and Ermland. 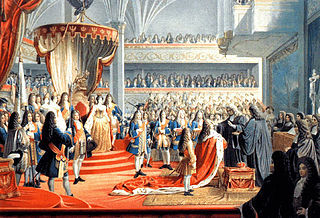 In a second treaty, negotiated on 24 February 1656 in Königsberg (Królewiec), Frederick William I concluded a defensive alliance with France. 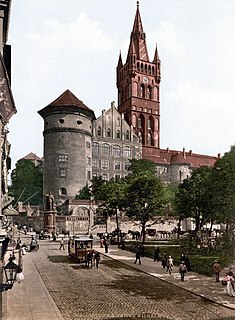 The Schlosskirche or Schloßkirche was a Protestant church within Königsberg Castle in Königsberg, Germany.